Aaah, that's such a lovely picture!! He is one fine gentleman. such a charming stud!!! i'm in love! so adorable how he's enjoying a childish ice cream cone in his dapper suit. I love that he is eating such a traditionally "messy" food with his perfect blue suit on. :) Great pic! he looks cute and cuddly!! Wow, am I the first commenter? Crazy. All I want to say about this is that I aspire to look as chic and put-together as that when I'm eating ice cream. Usually I'm just pretty sure I look fat. haha I love this photograph. It's making me hungry for some ice cream! His expression is golden. I love his attire and carefree manner of this photo. A great photo! this picture totally made my day…love it so so much!!!! reminds me of my grandfather who was a very dapper man, who loved an nice silk scarf,was very particular about his sleeve lenght and enjoyed a good ice-cream cone. Portraits like this epitomize how style (and your work) is about so much more than clothes. Not a spot of ice cream on him and he's enjoying it in style. Good stuff. It's good to see such a dapper man taking time out of his day to enjoy the small joys in life. Also, I absolutely love his rectangle knit tie! Beautiful!!!! I love his tie! I don't like this picture. Not because it isn't a great shot – it is. Not because the gentleman in it is poorly dressed – he's dressed superbly. I dislike this picture for the simple reason that it brings back vivid memories of eating Vivoli gelato in Florence by Santa Croce. And now my mouth is watering. Thanks a lot, Sartorialist. That cone looks so yummy! An icecream provides a playful take on a general suit: love it! His tie is great! I love seeing older gentleman eat sweets! It shows such a fun side of them. Great photo! The man looks so carefree, while he's eating the ice cream. He looks casual. Wow. I adore this! What's not to love. What a lovely and charming photo. hahaha, I love how he's trying hard to reist smiling too hard about the ice cream. This picture captures so well the Italian spirit – work is a serious thing ( he is dressed like a serious fellow) but to have a good time -to stop to enjoy life is equally important. What an unfailingly good eye Scott. Bravo! A men who knows how to have his ice-cream with style. What a gentleman! It´s great to have people like u around Scott, so talented! Able to find simple things and somehow make them look special so u can make our days much better. Thanks for sharing ur work with us! What a great picture! His clothing says "serious businessman" and the ice cream cone says "little boy". I love it! 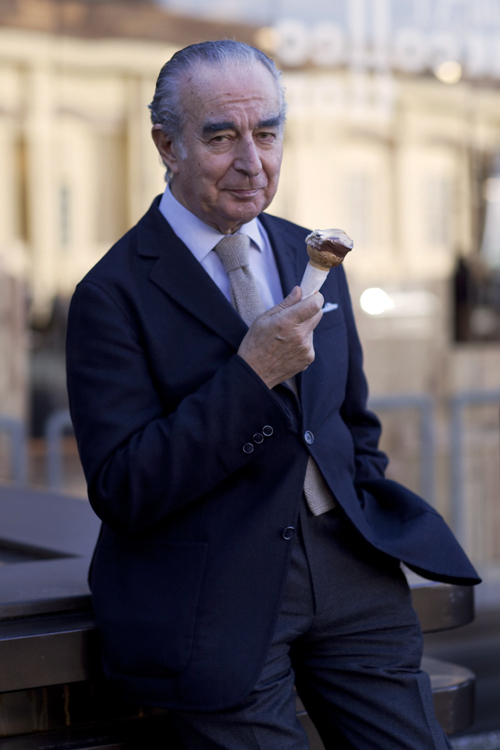 wonderful shot, love the juxtaposition between such a well-dressed man and the ice cream cone. Everyone like ice cream, right? Mmmm I want that icecream! I am now craving ice-cream/gelato. Yeah, thanks. don't get any on that tie! Great photography. Really enjoying going through this blog today. interesting shots. thanks. wish I could photograph in new york. He clearly cares about his clothes, but not so much that he'll pass up a chance to eat a (potentially drippy) ice cream cone on a beautiful day. Read: he's a man with a terrific sense of perspective. Such a classy guy. I love this photo. More of these classical pictures! And less of the hipsters! WHY NOT ICE CREAM ON HIS LIPS? IT WOULD BE A REAL CLASS ACT. nice eyebrows! looks like he could be a member of my family, my dad's and my grandfathers were like that too. this is a wonderful shot. so happy. sooooo italian! 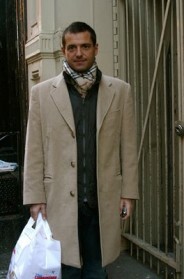 Really, Mr. Sartorialist: you make me proud of being italian. Thank you! This is one of the best photos I've ever seen! Now that is what I call a great hand held device! More power to him! that face is classic. can't beat an italian suit and gelato in florence, either. Aaaaaah, he looks just like my late granddad, and almost as stylish! And the nonchalance has carried over form his dress to the way he holds his cone. Ice Cream Mondays are my new tradition. The tie! And the suit! And best of all, the ice cream. Looking good gramps…and you know it. Best shots are those taken when the subject is at ease. Ace. Wish I was eating an ice cream in Florence! Good to see this is one of the rare blogs where older people are not discriminated against! Great style too, especially the tie. brilliant photo. i thought that i had nothing to learn about eating ice cream. such an expressive, cheeky look. I love this photo, I am going to Florence in two weeks, so visiting you blog makes me more hungry for the Italian fashion and streets ! Nothing wrong with a man enjoying a ice cream cone on the street. Just fabulous. This is one of my favorites of yours, ever. He reminds me of my dad, a man who happened to eat ice cream cones much in his last few years. The whimsy of his facial expressions and ice cream cone, combined with his elegance, just makes my day. Love his tie and shirt combo, the knot is perfect! wow, that's amazing catch; this gentleman has so much of dignity even when doing so trivial thing like eating ice-cream……. is that a knit tie?! He is lovely! I'm loving all your pics of older people! On holiday in France I kept seeing stylish old men everywhere I went, and I kept thinking they reminded me of the men on your blog! perfect summer season accessory. It goes with just everything! I love how this gentleman has chosen his tie to go with his favourite flavour! Genial photo and charming gentlemen. Who is it? the ice cream cone adds a beautiful touch of simplicity. Wonderful shot – it is so lovely to see a handsome well-dressed man enjoying an ice cream cone on a Monday. i can only wish to be as cool as him when i grow older. Nothing better than a classy man who loves ice cream. LOVING IT!!! a child at heart. This is so Italian I love it! i love that this man is eating ice cream!! Florence! and a Monday!! Such a gentleman as this, I have no words… Simply adorable!!! Now that's what I call a lunch break. This photo mans face says a thousands words to me! I would love to hear him talk.